Look no further for a unique invitation that pops! 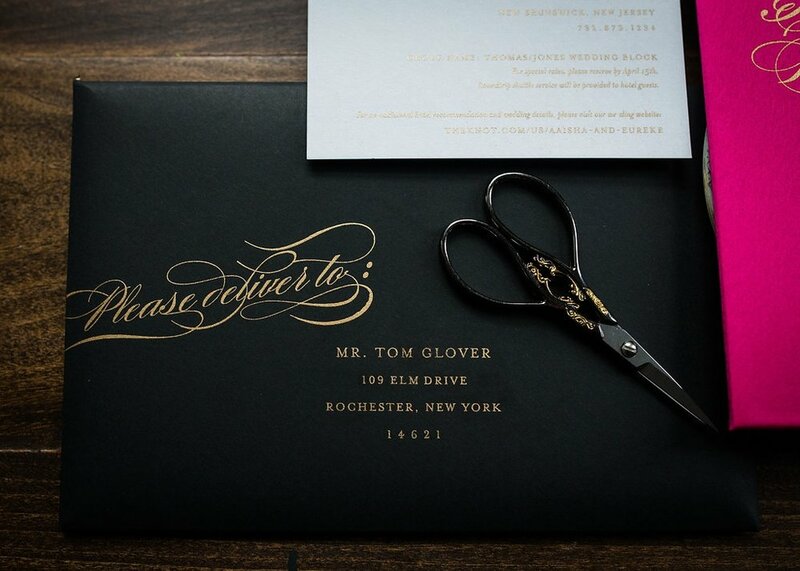 Gold ink is printed directly onto a satin fabric invitation. The satin fabric is wrapped around a thick board, giving the invitation an impressive weight. The backside of the invitation features a pocket, made of black velvet, to hold all of the enclosure cards. A striking metallic gold brush stroke design is printed on the invitation and envelopes, making this suite shine in all the right places. Our starting prices for satin board invitations are approximately $1,750+, while the average Penn & Paperie client typically spends $2,000+. These are rough figures based on a quantity of 100. To receive a custom quote, please fill out an enquiry form by clicking the button below that says "inquire about this product". Our average starting prices for satin board invitations are approximately $17.50 per suite (a suite consists of the invitation, rsvp set, mailer envelope, etc. ), based on a quantity of 100. There are a range of factors that can affect the pricing for invitations - like printing options, cardstocks, and the amount of enclosure cards. Knowing your budget helps us narrow down what options would work best for your project.